Now for some dramatic new art! 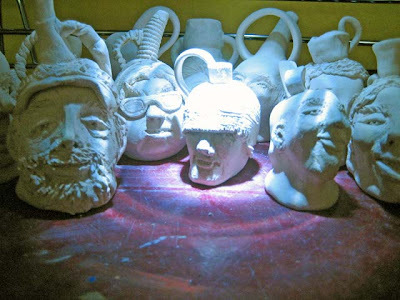 Here is a stage-y shot of most of the First Quarter of 2009’s year-long small face jug project which I have set for myself. Anyhow, years ago, when I was new to ceramic work, the Local Talk column asked, “If you were a vessel, what would your purpose be?” The range of and reasons for those answers still astound me. Those five people said they would be containers like ships, sustenance holders, and blood vessels! They would carry truth, food and oxygen in the interests of peace, cultural sharing and fun. I just never thought outside the utilitarian ceramic “vessel” until I read that column. Somewhere soon after that column came into my life, I got the idea to make a piece of art each week based on one of the faces from it. Well, it took nine years, but this is the year I am doing just that. Each Thursday morning I go out early and grab a Good Times, bring it home and gently tear out the column and date and number it with the week. I pin each one to the wall in my studio until I can make two or three weeks’ worth of face jugs at a time. I never know which of the three or four faces I will pick. Some weeks the faces are just so tantalizing and choosing is difficult. Some weeks, everyone just looks the same. Fortunately I have never sought to make portraits, but rather to use facial features, expressions, accessories and hair/hats as springboards for a fun little jug. Sometimes I am so lost in the faces I never even read the question or the answers! I sign and date the bottoms and stamp the week’s number into the leatherhard clay when I am done. 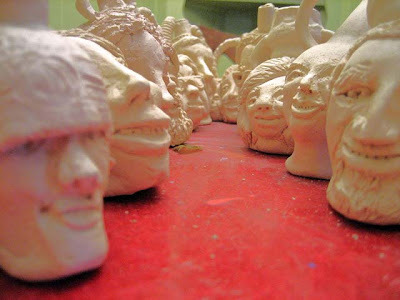 They are bisque-fired, but I am waiting to have the entire year done before I color and/or glaze them. A side benefit to this project which I did not foresee: almost everyone is smiling or at least has a pleasant expression. They are a gentle, amicable bunch, this First Quarter grouping. I have a bit more to say about actually making them, so will write about them again soon.